Found centrally in Galle, close to boutique shops and popular restaurants, 48 Lighthouse Street is a stunning colonial-era bungalow sprawling over two storeys with four bedrooms and ample open spaces. 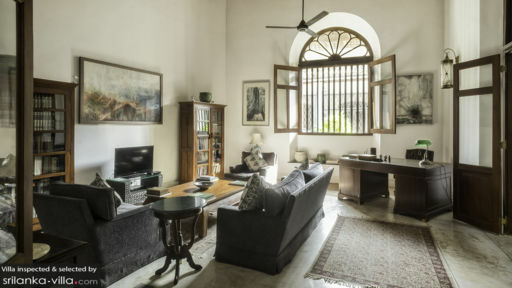 Inspired by Dutch-architecture featuring massive columns, arched doorways, understated colours, rustic and antique furniture, the bungalow will definitely take you back hundreds of years. 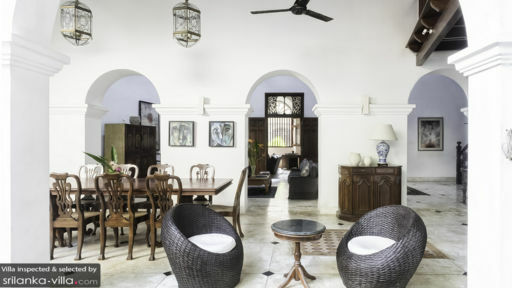 This awe-inspiring structure has been designed to offer a unique holiday experience to guests who can live in the lap of luxury and remain close to the major attractions of Galle city. The four bedrooms at 48 Lighthouse Street are straight out of a dream with poster double and single beds swathed in white linen drapes to keep the mosquitoes at bay. The rooms are air-conditioned, the ones upstairs lead to the terrace while the ones downstairs lead to the garden. The minimal, traditional décor shines abundantly through the artwork, Indian textile bedding, rustic furniture, etc. Each bedroom comes with an en-suite bathroom that is equally opulent with ornate interiors and modern amenities. Built in the splendour of a rich heritage and historical past, the villa features a corridor that runs along the entire property with pebbled and stone walkways, lush green plants and serene views of the blue skies. While enjoying a peaceful moment with loved ones, relax on the rattan wicker chairs found in the yard. This comfortable and refreshing corner of the bungalow is excellent for your morning tea and evening drinks from the house bar. There are lanterns illuminating the grounds at sunset for the most iridescent views and opulence. 48 Lighthouse Streets in all its colonial glory features spacious rooms and communal areas so that guests can gather around with ease. From one set of double doors, you can reach a second living area from the first. Arched doorways lead to the open-plan living area with plush couches you can sink in, bookshelves, and an antique cabinet as well as desks. Another living room inside serves as the indoor communal space and these two, combined, make for the party banquet of your dreams. For the lovers of history, each and every item in this room will prove worthy of careful observation. To enjoy the tranquillity and sense of calm outdoors, enjoy a rustic meal on the alfresco dining table found in the veranda with nothing but the sounds of nature keeping you company. The ceilings soar high above the rooms with long-stemmed fans to keep them airy and breezy. Wire-framed lanterns, both modern and traditional, cast their warm glow for the most awesome ambiance one can imagine. A chef is available on request for an additional cost all too delighted to prepare mouth-wateringly good Sri Lankan delicacies for you. The bungalow will cater to all your needs and demands efficiently as there is a team of professionals to look after everything from housekeeping to security. The staff will happily make arrangements on your behalf including appointing a personal chef, a chauffeured-car, and massages in-house. 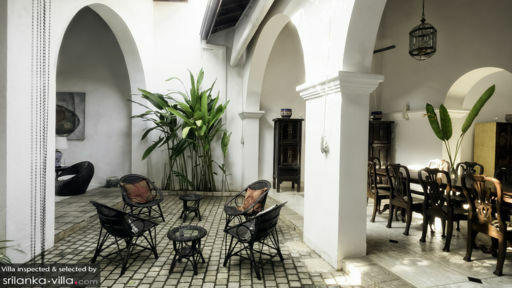 The most ideal location to be in is in the heart of Galle city – surrounded by boutiques, cafes, and restaurants. There is the famous and historical Galle Fort, a UNESCO World Heritage Site and of course the beach. For some exceptional cocktails head to The Living Room for an intimate and laid-back vibe and amazing company.